I had an occasion recently to dig through some of the ephemera I’ve collected through the years. In the bottom of one box, I laid my hands on a pocket journal I purchased decades ago at an antique auction in Greenfield, Indiana. 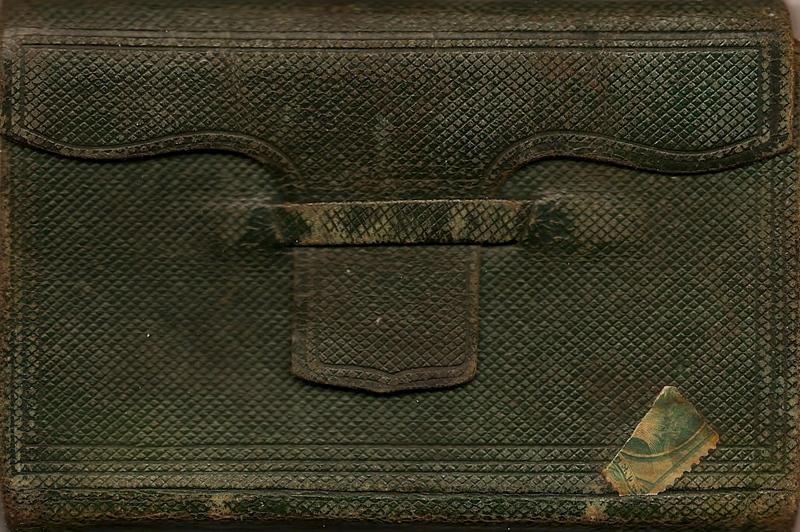 I recognized it as a journal typical of those sold to the troops in the field by sutlers during the Civil War. Most of the pages of the journal contain entries for stud service of a horse named “George” during the spring and summer of 1865. But near the front and buried deep in the last few pages are notations that tell us who first purchased the journal. Co. B 9th Ind. Vol. Cav. Hoping to learn something more about Hinchman, I decided to do a little research on him using the resources of the internet. I discovered that he was Joseph Vincent Hinchman (1846-1932), the son of John Hinchman (1822-1906) and Charlotte Blacklidge (1824-1894). I also discovered that he married (1st) Thursey Irene Crane (1846-1891) in October 1867 and (2nd) a woman named Hannah many years later. 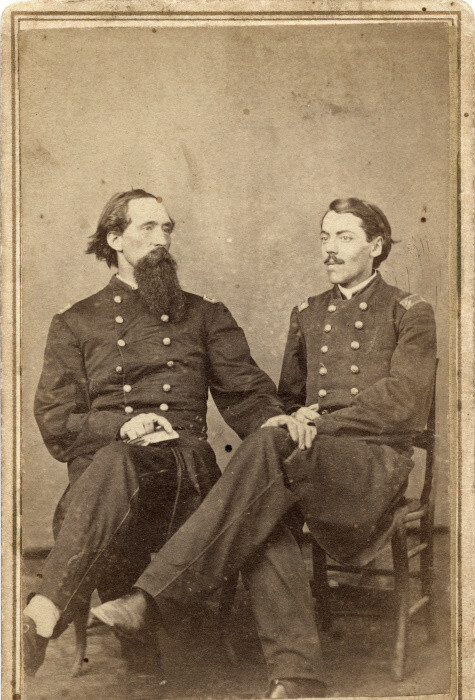 Researching his unit, I found that Joseph V. Hinchman was mustered into Co. B, 9th Indiana Cavalry on 13 November 1863, and mustered out of the service on 16 May 1865 as a First Sergeant. The roster for the company listed his hometown as Greenfield, Hancock County, Indiana. Subsequently I learned that most of the members of Company B were from Hancock County — places like Greenfield, Fountaintown, Cleveland, Palestine & Fortville, for example. A search of census records and city directories revealed that after the war, Joseph resided in Greenfield (1870) where he worked as a furniture dealer. By 1885 he was working in Indianapolis as a druggist. By 1893, he had moved to Omaha, Nebraska, where he also was a druggist. He remained there until at least 1917, then moved to Blair, Washington County, Nebraska, where his occupation was given as physician. In 1930, he resided in Grand Island, Nebraska, but died in 1932 in Blair. 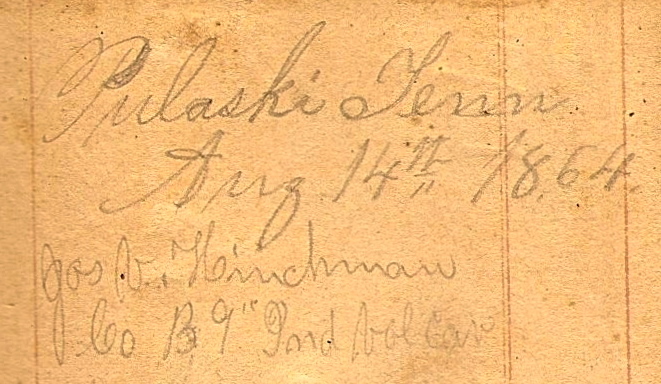 Hinchman’s entry indicates his company was in Pulaski, Tennessee. So when was the 9th Indiana Cavalry in Pulaski and when might this journal entry have been made? 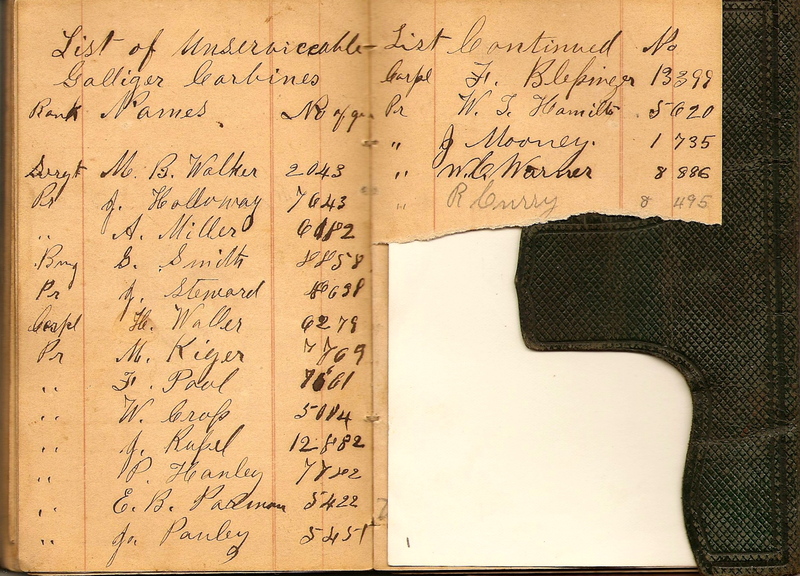 Service records for the 9th Indiana Cavalry indicate they left Indianapolis for Pulaski, Tennessee on 3 May 1864. I discover that Hinchman was among 27 men from Co. B led by Lt. John B. Harrod under the command of Maj. Eli Lilly who were attacked by Confederate General Nathan Bedford Forrest in an engagement known as “Sulphur Branch Trestle” near Elkmont, Alabama, on 25 September 1864. Though a few men from the company were killed and wounded, Hinchman — then an Orderly — was unhurt and was among those who were taken prisoner. I also learn that he was marched off with other prisoners to Meridian, Mississippi, and then to a prison at Cahaba, Dallas County, Alabama. He was not exchanged until the end of the war. It stands to reason that Hinchman’s pocket journal was acquired sometime between May and September 1864. The reference to “Capt. 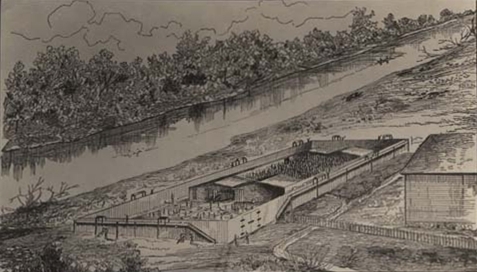 Walls” [William R. Walls of Sugar Creek] does not help us with dating the initial entry; except that it was written before Wall’s December 1864 promotion to Major. Deep within the journal are two other pages clearly penned by Orderly Hinchman. They pertain to the Gallager Carbines that were issued to the horsemen of the 9th Indiana Cavalry when the regiment was formed during the winter of 1863-64. Apparently there were a fair number of these carbines that were not in very good condition and Hinchman was tasked with compiling a list of the carbines that were considered “unserviceable.” He found at least eighteen. 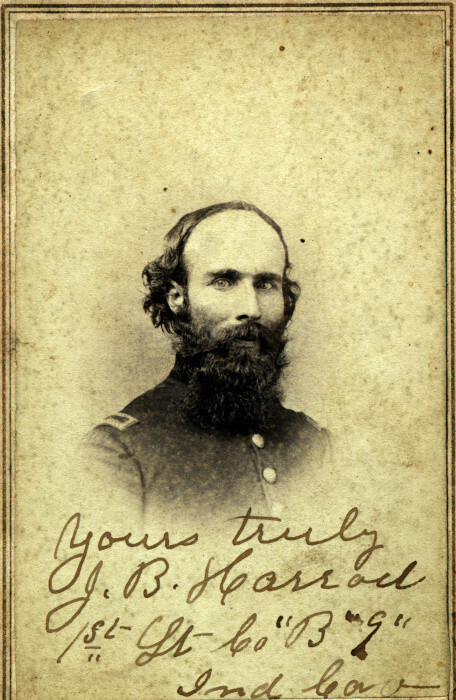 Prior to the battle at the Sulphur Branch Trestle in September of 1864, it is known that each man of Company B was issued 40 rounds of ammunition. But when the dismounted soldiers ran out of ammunition for their Gallager Carbines, it is recorded that they whittled down Springfield ammunition to fit their carbines. To see a Gallager being fired, check out the following video. The Gallager had the reputation of being the worst of the carbines issued to cavalrymen during the Civil War. 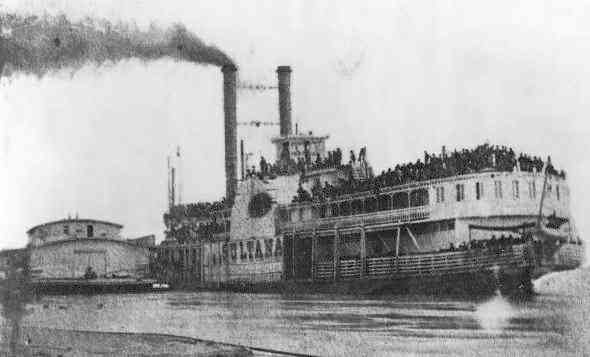 Sultana Steamboat on day before explosion. Note the overcrowding onboard. There is one final interesting footnote to this story. Three of the men appearing on Hinchman’s list of unserviceable carbines above (those whose names are highlighted with bold font) were returning home from the Cahaba Prison Camp aboard the steamboat Sultana and were killed when the boat exploded and burned on 27 April 1865. Built to carry a capacity of 376 passengers and crew, the boat was loaded with 2,100 soldiers and 200 civilians the night she blew up, killing all but 600. For more about the Sultana Disaster, click here.